“Why?” was the most common response either Neumann or I received when we told anyone we were taking a weekend excursion to Indianapolis. Why? The city happened to fit all of our qualifications for a weekend destination: 1) Be a large city. 2) Be nearby. 3) Be cheap. After a very comfortable 3-hour Megabus ride (round trip: $20) we were dropped off near our hotel just outside of downtown Indianapolis. With the weather crisp but ever-comfortable, we decided to walk around the city we intended to tame over the coming days. Last year’s Superbowl was very kind to Indy. Because of the mega-event, the downtown was clean, well-lit and we encountered many improvements (such as a multiple-block pedestrian walkway with an arcing steel frame) implemented because of the big game. As we continued to wander, large milkshakes in hand, we noticed a thriving area in the south of downtown, known as Wholesale District, with lines of people outside at bars. This was in stark contrast to downtown Chicago, where visitors would be advised to steer clear as soon as rush hour is over. Downtown Indy is very walkable — even more evidenced by the fact that both major sports stadiums are within a 10-minute stroll from each other. 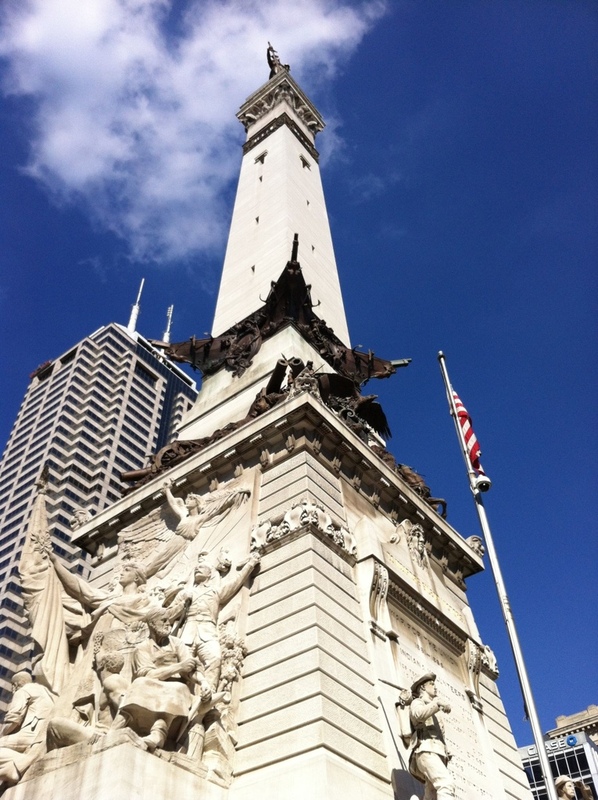 As we made our way back to the hotel, we passed by the massive 20-story Soldiers’ and Sailor’s Monument at the enter of Indianapolis that forms a circle from which the city radiates. The fountain at the base of the statue was lit up and we noticed the shops that formed the heart of downtown, one of which being an old-fashioned candy and soda shop. Yes, we were glad to be among the Hoosiers. Our first official Hoosier meal was a good one — breaded pulled pork tenderloin sandwiches. Neumann and I awoke the next morning ready to knock off the first item on our “must-do-in-Indianapolis” list — finding the closest thing the city had to a signature dish. Whilst in New York, we delighted in eight-inch tall corned-beef-and-pastrami sandwiches and thin crust New-York-style pizza. 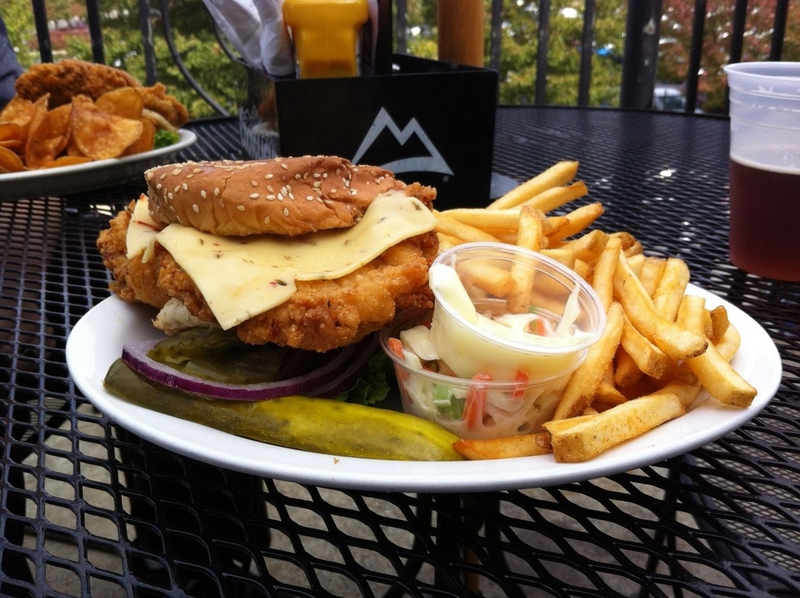 Unfortunately, Indy doesn’t have anything that it’s as well known for, but after some research we found that pretty much every respectable restaurant contained a common item on its menu celebrating the area’s German heritage — a breaded pork tenderloin sandwich. Walking across the downtown to the Bourbon Street Distillery, which Neumann’s research yielded had the best pork tenderloin sandwich, we ordered up our first meal as guest Hoosiers. And we were not disappointed. The tenderloin itself was about twice the size of the bun, and with flakes of the breading falling off as I lifted the behemoth to my mouth, I knew it was one of those sandwiches that, once off the plate, could not be put down. This was mainly due to the fact that it was so delicious (I put a little spin to mine by adding pepper jack cheese in addition to the standard mayo and tomatoes) but also because of the awkwardness of holding the disproportionate sandwich. As we leaned back in our chairs, I couldn’t help but wonder why the “crossroads of America” didn’t toot its own horn a little more when it came to this signature sandwich. Notice how no one is around… anywhere. We waddled out of Bourbon Street and made our way to the next item on our itinerary — boating in the canals. Indianapolis was intended to be a harbor city servicing the White and Ohio Rivers. But because of certain financial troubles, and the fact the founders founded a city before finding out the river was full of sandbars and shallow patches, the canals were built but largely useless. 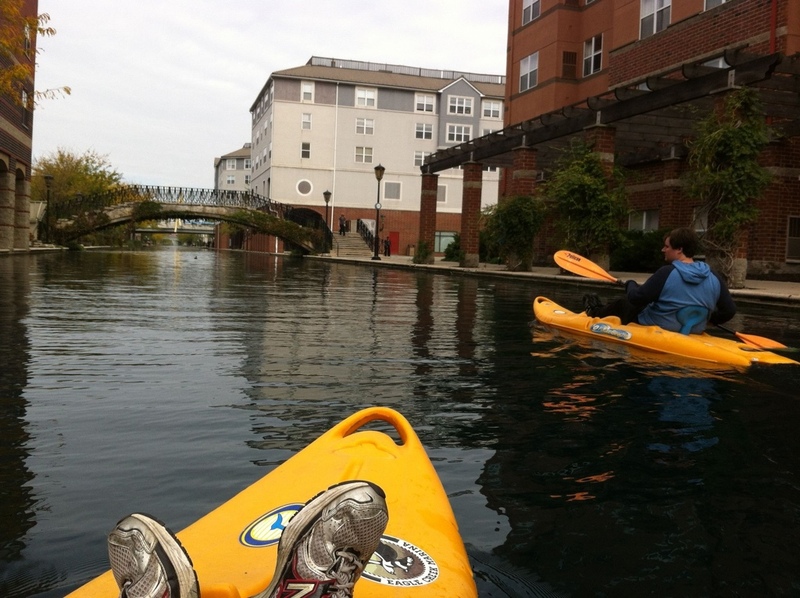 Apparently they were a rundown portion of town until the 90s, when the city reinvigorated the area by building upscale condos around the 1.6-mile waterway and filling the banks with fountains and vine-covered bridges. As Neumann and I made our way down the stretch on our twin kayaks — we chose separate vessels instead of the more romantic paddle boat option — we noticed how pretty but how seemingly underutilized the area was (Neumann even went so far as to dub it the “Venice of the Midwest.” Yes, there are gondolas you can ride for an obscene price). The area was classy enough, but all the storefronts along the way were empty. We envisioned a bustling district in the summertime with bars and restaurants along the canal where you could park and grab a drink or bite to eat. Sadly, it didn’t appear that idea had caught on yet. Maybe it would have to take another 20 years. The monument at the center of town. Indy loves its monuments. Seriously, they’re everywhere. We had a couple hours to kill before it was time to see the comedian we had tickets for that night, so on our way back to the hotel, we stopped at the arcade at the downtown indoor mall and spent a couple bucks on electronic bowling and Big Game Hunter (where one dollar will get you about an hour of play… you could say it’s a buck for a lot of bucks. Get it?). Even though this wasn’t quintessentially Indianapolis, it somehow seemed appropriate to spend some time in a mall during a Midwest vacation. We also felt obligated to visit the city’s central monument and elected to pay the $2 to take the elevator to the top and check out the view rather than huff it up all 20-odd stories. After a satisfying dinner at Scotty’s Brewhouse where we had some very cheap locally brewed Scottish ale called Dragon-something left over from Gen Con (apparently a giant sci-fi convention that we missed only by a couple weeks… and to think, my Klingon costume was ready to go), we headed to see comedian Ari Shaffir at Cracker’s Comedy Club. He was a good show, preceded by some not-so-good openers. As we left the club and headed back to our hotel, we got the sense that, like the night before, downtown Indy at night had a lot going on. But we were tired and ready for the next day and our visit to Indiana’s greatest (and only) president’s house.